Under Sliabh Dá Éan ('mountain of two birds) lies a small but beautiful hidden lake. 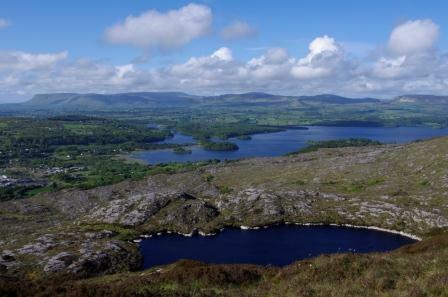 Legend has it that got its name Lough Dhá Géanna from the story of king Sweeney. Sweeny was a king condemned by an angry cleric to wander, naked and nervous as a bird throughout Ireland.Any sharp sound , like the ringing of a bell, would send Sweeney into madness. Because of the curse he began to levitate and move about like a bird. Being bird-like he could never trust humans but fled from place to place, naked and hungry. Near Lough Gill, in the eastern Ox mountains , Sweeney fought with a Cailleach, a wise woman, and both of them in their struggle transformed into geese and dived into the lake. Never to be seen again.